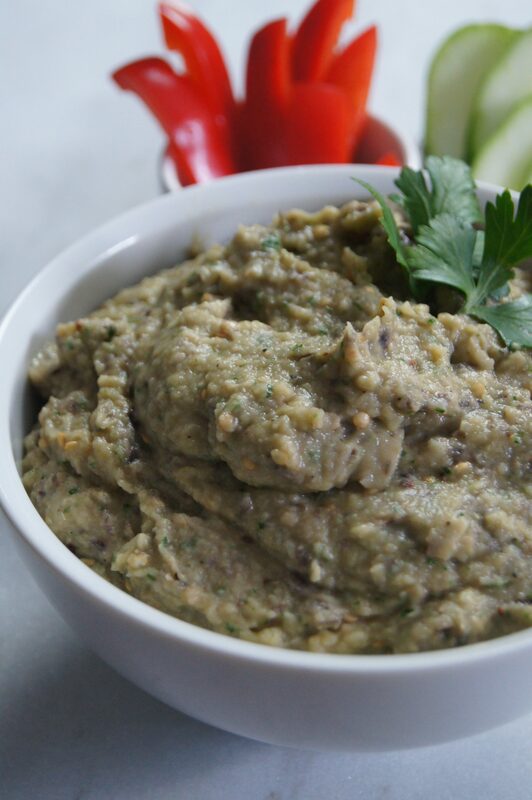 You know how they say, “Don’t judge a book by its cover?” The same applies for this roasted eggplant hummus. I’ll be honest, this isn’t the prettiest thing. But just because it isn’t pretty doesn’t mean that what’s inside isn’t amazing. And that’s what this roasted eggplant hummus is all about. (Interestingly enough, the same can be said of people too.) It’s so delicious and tasty. And dipping fresh cucumbers and peppers in it just gives you a huge burst of really great flavor. Both of my sisters have green thumbs. Being the middle child, I of course have to be the odd one, and have the opposite of a green thumb. What is the opposite of a green thumb anyway? Gangrene? (I know that’s not a color, but an awful thing. And awful is what happens when I take care of anything that was once green.) Plants, vegetation – whatever it may be – chances are it will not live long under my care. I’m kind of like a serial killer for plants and anything that grows in soil. My younger sister, Joanna, has a garden and has grown some beautiful eggplant. She was looking for some eggplant parmesan recipes. I don’t have one, though eventually I’ll have one here on The Tasty Page. Especially since she’s planted (pun intended) eggplant parmesan in my head and now I want to have some. 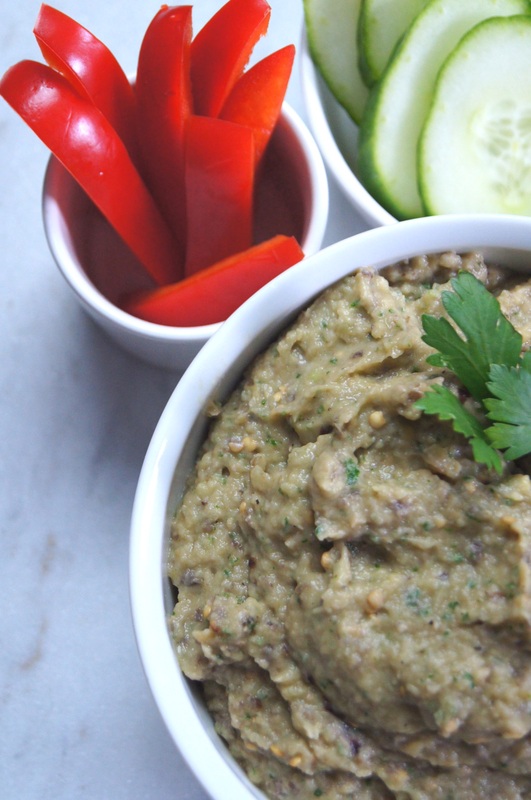 What I do have in my eggplant arsenal is this Roasted Eggplant & White Bean Hummus. It’s so easy to make, has a lot of great flavor, and is healthy too. I love hummus and this recipe is a nice variation on what you would traditionally pick up at the store. You can have it as a dip, or you can spread it in a wrap with some fresh vegetables and grilled chicken. And I’ve done a test on how good it is as an accompaniment to wine night. I can happily give it an A and a gold star. It’s also something that’s easy to make ahead of time so you can open that bottle of wine faster. Preheat the oven to 450 degrees F and place an oven rack in the middle. 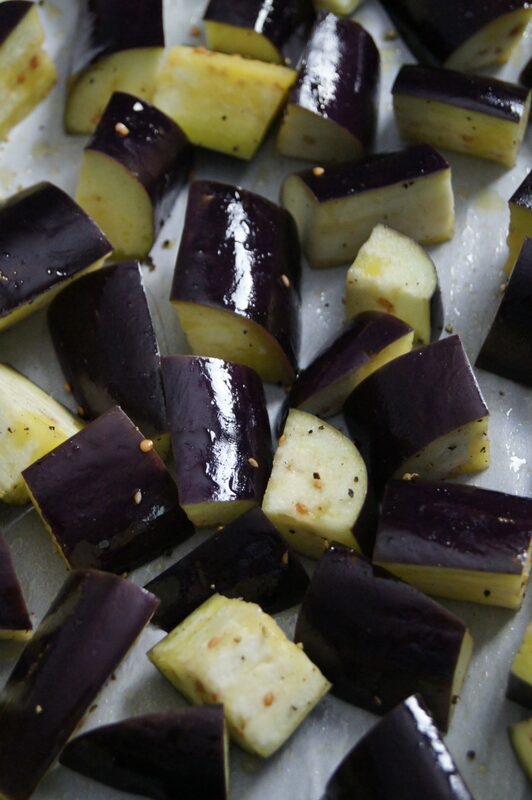 Place the eggplant on a parchment paper-lined baking sheet. Drizzle with olive oil and season with salt and pepper. Roast for 20 to 25 minutes until golden brown. Set aside to cool. In the bowl of a food processor, combine the beans, parsley, lemon juice, garlic, 1/2 teaspoon salt, and 1/4 teaspoon pepper. Pulse until the mixture is coarsely chopped. Add the cooled eggplant. With the machine running, gradually add 1/3 cup of olive oil until the mixture is creamy, but still maintaining some texture. Season with salt and pepper, to taste. Place the hummus in a dipping bowl and serve with the cucumber and red pepper slices. Alternatively, spoon the hummus over the cucumber and red pepper slices and arrange on a serving platter. You can also spread the hummus in a wrap with some fresh vegetables and/or grilled chicken.